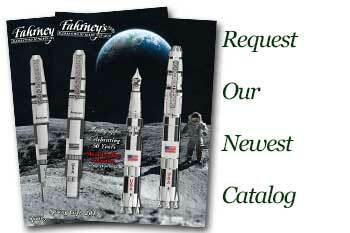 Order your Fahrneys Exclusive Esterbrook Circa 1937 Fountain Pen today from FahrneysPens.com. Fine Pens, Refills & Luxurious Gifts – great prices & fast shipping. Esterbrook, America’s Original Pen Company since 1858, brings you the new Circa 1937 inspired by the golden era of fountain pens. Its Art Deco styling is created from beautiful vintage-look acrylics accented with a silver-plated clip and double rings. The fountain pen with threaded cap features a German-made iridium nib etched with the Esterbrook logo. The capped rollerball is an alternate choice. Let the Circa 1937 transport you back in time to the elegant heyday of fountain pens! Cartridge/converter fill.